View A.J. LeBlanc Heating's Mini Split Installations. 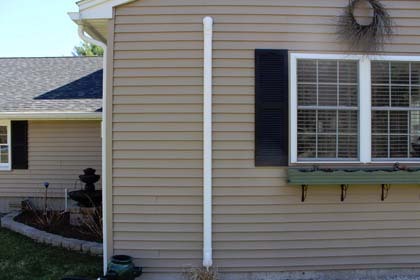 Ductless mini-splits offer comfort with little modification to your home's current structure. Conventional central air conditioning requires air duct systems which tend to be bulky and can require special structural attention. 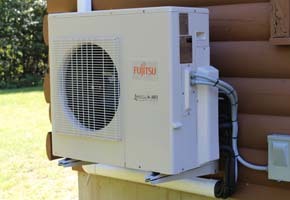 Ductless mini-splits use copper refrigeration tubing and multiple air handlers to move air throughout the home. The result is whole home comfort at minimum cost. 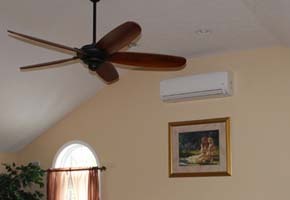 Ductless mini-split systems offer zoning at minimal cost. Each zone receives its own dedicated air handler allowing for precise control of the areas temperature and fan speed. 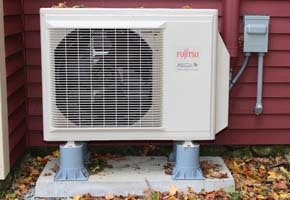 A ductless mini-split system can contain up to four zones per outdoor unit (with options for multiple outdoor units). A wireless remote in each zone allows the home owner to adjust each zone to his or her own comfort level. Copper tubing running through a small 3 to 4-inch opening in the wall or ceiling easily connects the indoor and outdoor units. Refrigerant is cycled through the lines from the outdoor condensing unit to the indoor unit, where the air is quietly distributed to the interior space. Because installation is easier you save drastically on labor costs compared to traditional air conditioning. 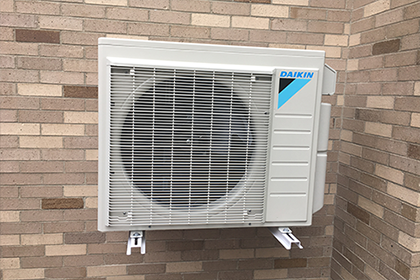 Ductless mini-split systems like traditional air conditioning systems locate noisy components outside, however ductless mini-splits also eliminate the need for furnace blowers and ductwork meaning they are great for retro-fit or boiler occupied homes. By eliminating these components homeowners experience less HVAC system related noise and are no longer restrained by duct limitations. In addition ductless mini-splits can provide multi-zoned comfort. Even more remarkable, these same units have heating capabilities in the winter, absorbing heat from the outside air and moving it indoors to heat your home (Heat Pumps). The result? Efficient cooling and heating for year-round, whole-house comfort in most climates. LeBlanc Heating has several testimonials from customers which claim that their installed ductless mini-split system has reduced their fuel consumption as much as 45%. Decreasing your carbon footprint through the reduction of fossil fuel consumption is just an added benefit. Mitsubishi Electric INVERTER-driven compressor systems use only the exact amount of energy needed to cool or heat an area. 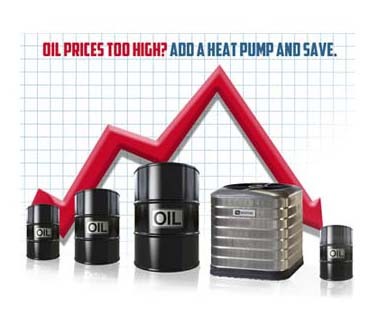 So you can save energy and money while enjoying complete control over your comfort year-round. Call A.J. LeBlanc Heating for a free installation quote. Halcyon products have been designed to provide zoned comfort for residential and commercial applications. Engineered to install quickly and easily without ductwork, Halcyon systems provide cooling and heating solutions where others cannot. 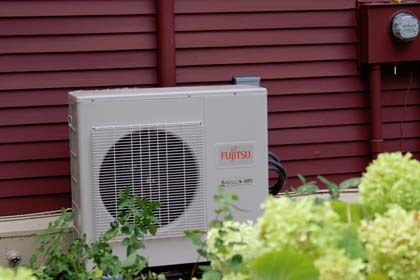 LeBlanc Heating is NH's only 5 star Fujitsu dealer. Yearly maintenance is required for all equipment that LeBlanc Heating installs. Our service department is staffed with NATE certified technicians who handle maintenance. NATE is the leading certification program for technicians in the heating, ventilation, air conditioning and refrigeration (HVAC/R) industry. NATE has the only test supported by the entire industry. Should any problem arise during our contracting of work performed, we are fully insured.